BENIN CITY, Nigeria, Jan 8 2019 (IPS) – Thousands of migrants mainly from Sub-Saharan Africa have died or ended up in slavery as they attempt to travel to Europe irregularly through the desert and across the sea. Many were recruited by traffickers who deceived them into believing that the passage to Europe would be safe and easy. The International Organization for Migration, IOM, has embarked on a peer-to-peer campaign aimed at letting vulnerable people know the real dangers. 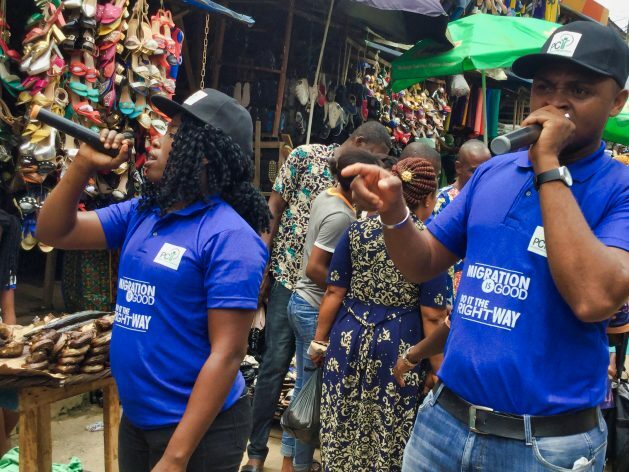 Migrants who returned home after their failed attempt to reach Europe have been engaged volunteers to tell their harrowing stories in markets and other public places in Lagos, Nigeria’s commercial capital. The voice from the Public Address system urges people to travel the right way and not to kill themselves with the dangerous journey through the desert and sea. Messages like this were spread within some Lagos markets by returning migrants.